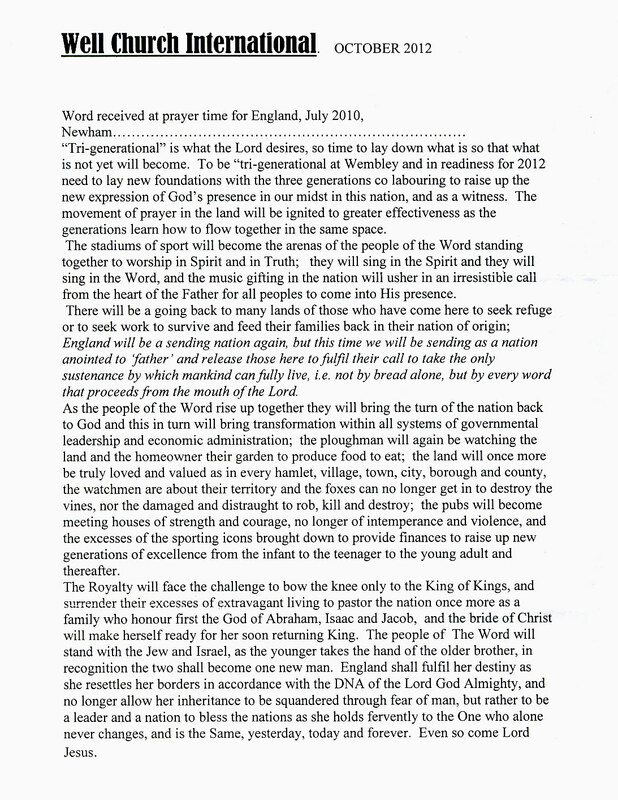 Amen, and Lord may Your Holy Presence come and put the rising spirit of rebellion and anarchy under Your feet…Thank you to Gillan, for I believe this is more timely than we may conceive, and to Richard Parkhouse for your contribution too. Last week I had the privilege of being taken round the Houses of Parliament. I have to admit that this was the first time I had ever visited, which might come as something of a surprise given the subject matter of this blog. I’ve seen it plenty of times from the outside and even studied its architecture at great length at university. Like most of us, I’ve become acquainted with it through viewing it endlessly on the television news. Yet despite this familiarity, actually being there and seeing it in person is a wholly different experience. 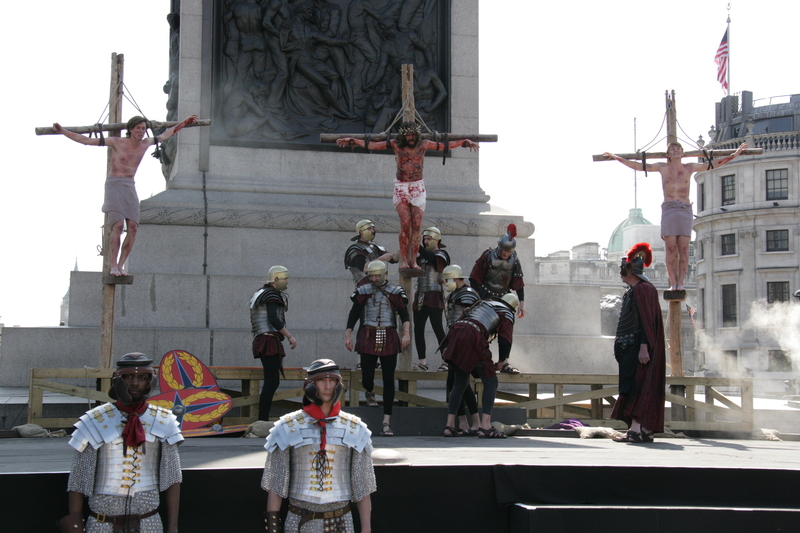 Last Sunday I spoke at church to a couple of members of the Wintershall Players about Good Friday’s Passion in Trafalgar Square, as in my earlier post. Having watched it live we felt the power of the holiness of the re-enactment. Our minister was there and could testify to the strength of God’s presence in the square. Nearby, one man wept openly and two men who’d been drinking and chuckling to themselves about the play suddenly stopped, became quiet and even reverential. T he trials by Jewish priests and by Roman governor Pilate as well as the crucifixion were performed at the foot of Nelson’s column. Tourists on board open-topped buses must have been amazed on passing by, taking photos. An ambulance was present for the 3 ‘crucified’ to get warmed up after long exposure to near-freezing temperatures in a bitter wind. “I focus upon my role and a peace just comes upon me”, was James’ reply. His focus is most intense during the Way of The Cross, his near-naked walk from the judgement seat of Pilate carrying the heavy cross to Golgotha, the site of crucifixion. This was a done through the crowds on Trafalgar Square, just like in packed ancient Jerusalem. The audience was deeply affected and the soldiers have been instructed to steer anyone who’s moved to come to James’ assistance away from him so he can stay undistracted ‘in the zone’ of deep, contemplation through scriptural prayers well-known to Catholics. My friend recalled his admiration, after the resurrection, when watching James speak so carefully and warmly to the crowd whilst he watched, measured and responded to individuals’ reactions. The whole drama of jubilant entry into Israel’s ancient capital, confrontations with the high priest and his delegation in the Temple, betrayal by a close disciple, ‘Last Supper’ to celebrate Passover, night-time arrest and secret trial, judgement by Roman governor, severe scourging, ‘way of sorrows’, crucifixion, death and triumphant resurrection were all so profoundly instructive and moving. Click here to watch and be blessed. For a gallery of photos see Mail Online, its accompanying text by a secular journalist. Yesterday’s remarkable performance in very chilly Trafalgar Square is now available for you to watch on demand on Wintershall Live . We are very grateful to Peter Hutley and his various teams, as well as all supporters and local authorities for enabling this to be staged in the centre of London. May the Lord continue to bless you all more mightily. To watch click on image below, and for more information with links click here. The Mail Online photo gallery splendidly conveys the high drama of Jesus’ entry into Jerusalem, clash with the priesthood, Roman trial, crucifixion and joyous resurrection. Other online press reviews are at The Guardian, Independent and Daily Telegraph. 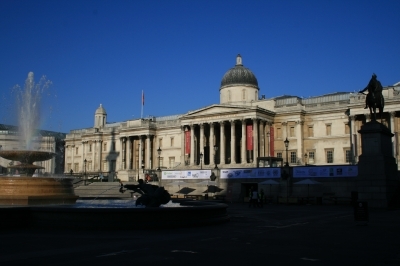 TRAFALGAR SQUARE; from where distances to London in Britain are measured. It will be not only the navigational centre but also the spiritual centre of our nation today, 29th March, Good Friday 2013. What a fitting juxta-position! Good Friday commemorates the day Jesus Christ gave His life for you and me so that our sins can be forgiven. We are thus able to be reconciled to Almighty God and gain access to His holy presence. Only Jesus’ blood shed for our forgiveness enables anyone to come to Our Father. That’s why Jesus Christ is the only way to Him. He is The Way, The Truth and The Life. 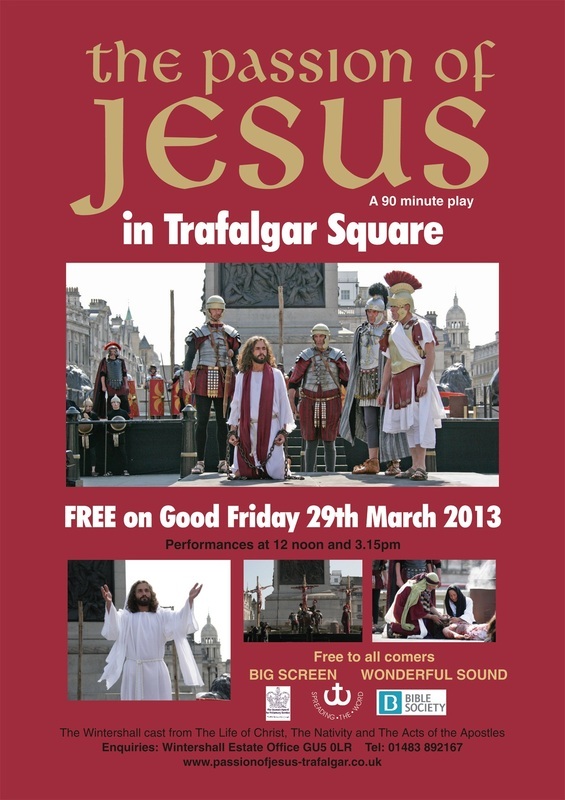 After last year’s successful Passion performed by the Wintershall Players to a packed audience of thousands in Trafalgar Square, they have again been given permission to perform this inspirational play on Good Friday 29th March 2013 at 12 Noon and again at 3.15 p.m.
Read the full details on The Passion of Jesus in Trafalgar Square and learn about the amazing story of the Wintershall Players. Two workmen last night thanked ‘divine intervention’ for their astonishing escape from death as a helicopter crashed into their crane and turned into a fireball. 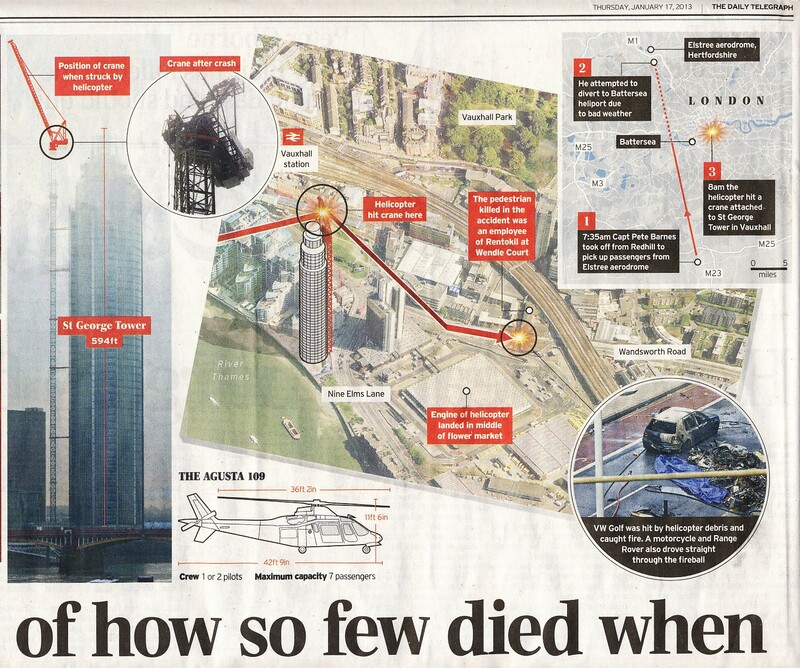 The pair should have been in the cabin when disaster struck, sending burning debris cascading 700ft on to the rush-hour streets of London below. Instead, Richard Moule and his colleague Nicki Biagioni were late for work – both had overslept for the first time in years – and missed death by minutes. ‘Miracle’ of how so few died when fire rained down on the rush hour – The fact that only two people died when a two-ton helicopter crashed on to a busy road during the morning rush hour was nothing short of miraculous, police said. Fate contrived an extraordinary set of circumstances to limit the death toll to the helicopter pilot and a pedestrian, including a red traffic light that kept the crash site almost entirely clear of vehicles. “It doesn’t take a great deal of imagination to think what would have happened if that helicopter had crashed onto a bus or a heavily-occupied building,” said Boris Johnson, the Mayor of London. I’ve commuted through and driven around this area many times when I lived in greater London, including the same areas as both families. Whenever I visit I can find my way around quite easily but am always surprised at so many tall buildings in our capital city. 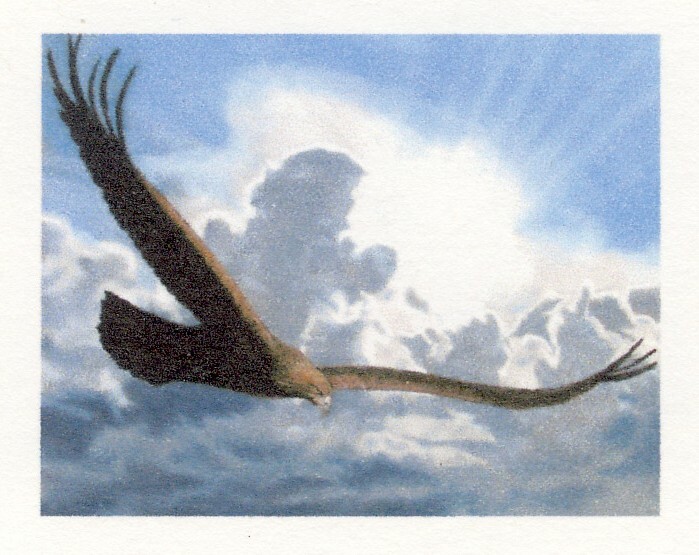 Nina reminded me many people escaped death during the infamous 9/11 Twin Towers attack simply because they’d been divinely warned and stayed away. Traumatic as any unexpected death is for their family and friends, there has definitely been an amazing protective blessing over this accident – perhaps angels ‘arranged’ the fixed ‘stop’ light? It indicates the Lord had a hand in this, perhaps to prove His grace to everyone, believer and unbeliever alike? Be amazed as you read the reports, see the images and consider the details…and then thank the good Lord. 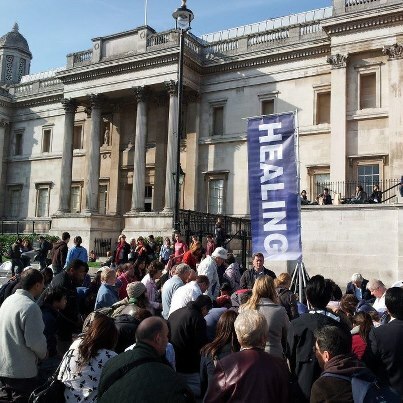 A fortnight ago today was my birthday ‘on the town’ in Trafalgar Square, where we went to practise healing on the streets. 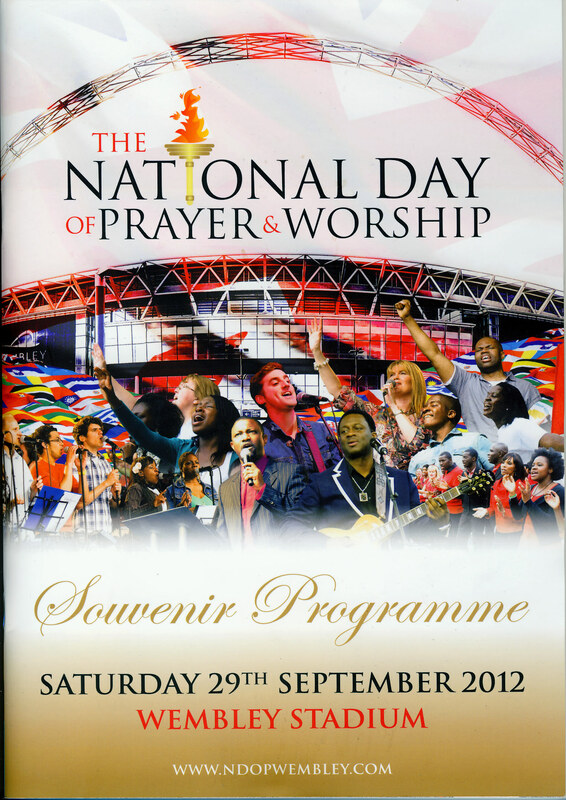 And a week ago today we were at Wembley basking under its open-roofed stadium – reminded me of an ‘open heaven’. Arriving as the gates opened at half-past midday, we found our seats only nineteen rows from the lush-green turf and directly across the pitch from the musicians’ stage. Within minutes the various bands, choirs and well-known worship leaders greeted us with worship songs and a tremendously uplifting day commenced. As may be seen from the programme below, it focussed upon various national and international needs and went by far too quickly. Some time was spent in repentance in accordance with the out- come of the ‘Listening Hour’ in Parliament on 12th June (click for brief summary). Click to read this brief report how Wembley was submerged with waves of prayer and praise and flick through this photo gallery to get a glimpse of what was going on. Also, read about the amazing beginnings to this event in my next post. Our deep gratitude goes to Fleet Baptist Church and their secretary’s skills in organising a couple of coaches packed full with those wanting to attend this stirring event. 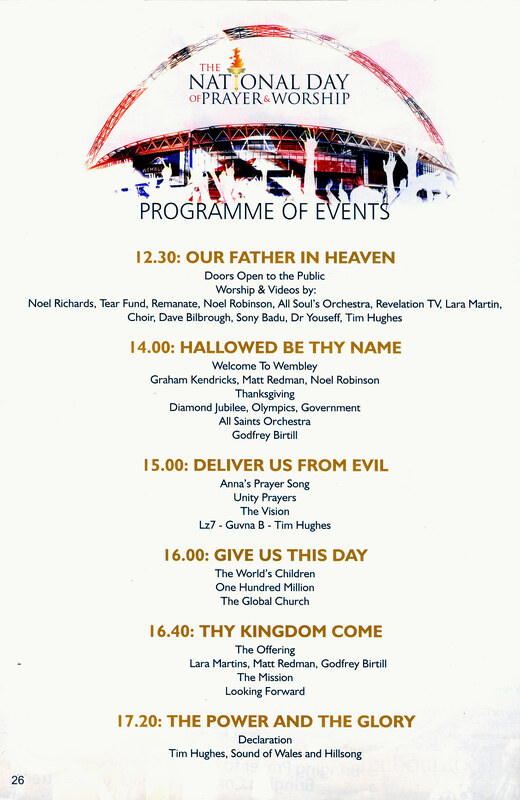 THEN, next day at church we found the following prophecy from 2010 about Wembley had been submitted and printed onto the new schedule for October: a God-incidence? In Part 1 I started a ‘taster’ of our day with Mark Marx, founder of Healing On The Streets (HOTS), when he taught on praying for healing in public. Over a hundred delegates then went to Trafalgar Square to pray and were bathed in warm sunshine. 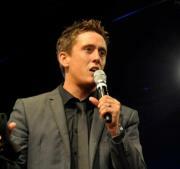 Part 1 asked, what does Mark teach and is it different to prayers in church? I’ll attempt an answer below with some subsequent insights all of which, I submit, will be of interest and application not only to readers in the UK but also to those overseas. First, however, have you heard about the Alpha Course? This friendly and very social course is a means of introducing non-believers to the history and beliefs of Christianity. The course started in Holy Trinity church in Brompton, London, and most branches of the worldwide church now conduct an Alpha course – for more see website. 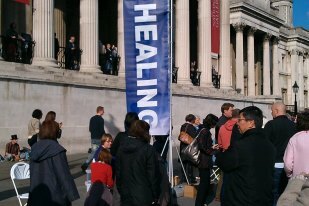 It is now reported that Healing On The Streets is growing even more quickly than Alpha! So what does its founder Mark Marx teach? This very brief overview is my own, not official, but HOTS’ scriptural found-ations and most of the principles are similar to those taught in Christian ministries. HOTS’ especial emphasis is upon expressing God’s compassion and love in the market place, whatever the weather and, thereby, enables the church to connect directly every week with the community it serves. HOTS’ ‘secret’ is not truly such, for it is Christianity’s special feature that distinguishes it from every other religion; it is the presence of and our reliance upon God’s Holy Spirit. This is something even those who are not Christians can sense, and which they can therefore physically experience and react to; e.g. “This is weird but I’m feeling…”. For example, in making a brief mention of HOTS’ work across London at last month’s Revival Alliance Gathering in Birmingham, Gerald Coates referred to that special effect upon a completely uninterested passer-by. This man turned upon the team to accuse them of having pushed him – but they were busy praying for someone! They told him it was the strength of God’s presence he’d felt. So, even if someone doesn’t receive any prayer it’s likely they’ll be affected. 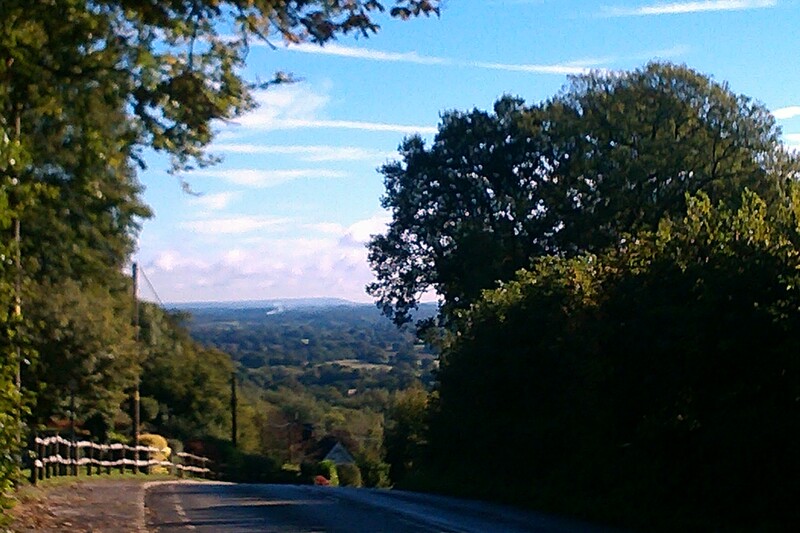 Anyone who misses this could be completely closed off to God; maybe that’s why they’re known as ‘the lost’? The Muslim passer-by returned with his family and they all knelt and gave their lives to Jesus Christ! Praise you Lord, keep blessing them and their friends. 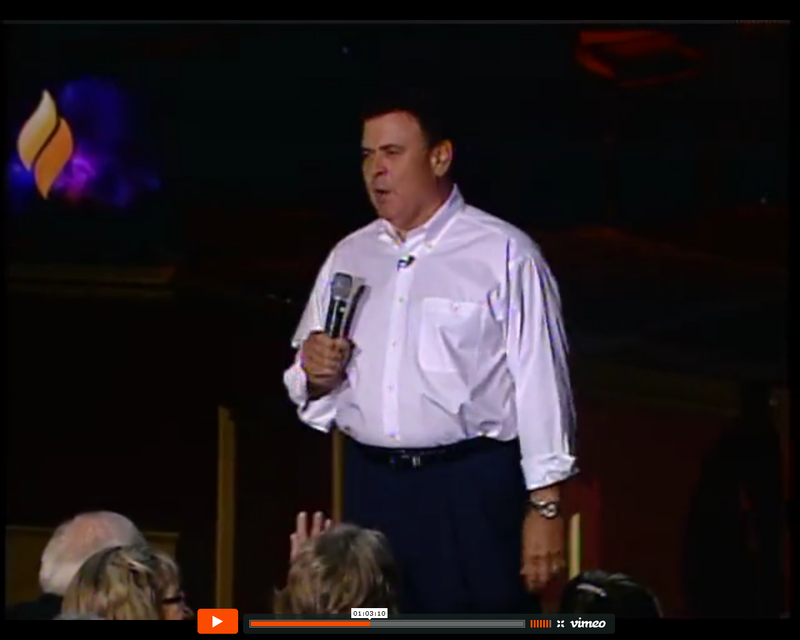 In quoting a scriptural principle to back up his statements about the presence of God, Mark used one I’ve never heard any preacher mention in this connection. BUT it is one I became personally aware of in a most dramatic way – AND with being in the very same connection as Marks’ explanation! So that served to validate his teaching. One of the other distinguishing marks of HOTS is to convey the ‘compelling love of Christ’ to everyone so they may sense his peace, even in the busiest environment. The truth of that scripture cannot be denied but it brings sadness to each believer for the lost and their future. Whenever Mark cited cases of medically inexplicable healings arising from HOTS ministry I often recalled the obduracy of atheists I’d encountered on several blogs this year. Their mindsets seem to be encased in ‘concrete’ that prevents them from rational examination of evidence. For example, the lady who complained to the ASA about HOTS in Bath and, in Trafalgar Square, a young man strode past me to get away from the large gathering and remarked to his girlfriend, “It’s a scam!”. Mark had told us to watch people’s body language and make good eye contact before trying to hand out a leaflet and invite them to receive prayer – so this couple were avoided. Our group was sandwiched between two other public offerings – ‘free hugs’ and a few men performing dance and acrobatics to pop songs. Nina reminds me how appropriate it was to hear them singing, “I believe in miracles”!! 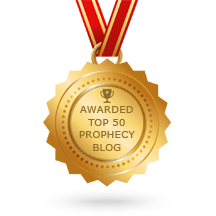 It was a most memorable occasion and I’ve since received a few insights into God’s action plan, which I’d like to share in another post – click here. 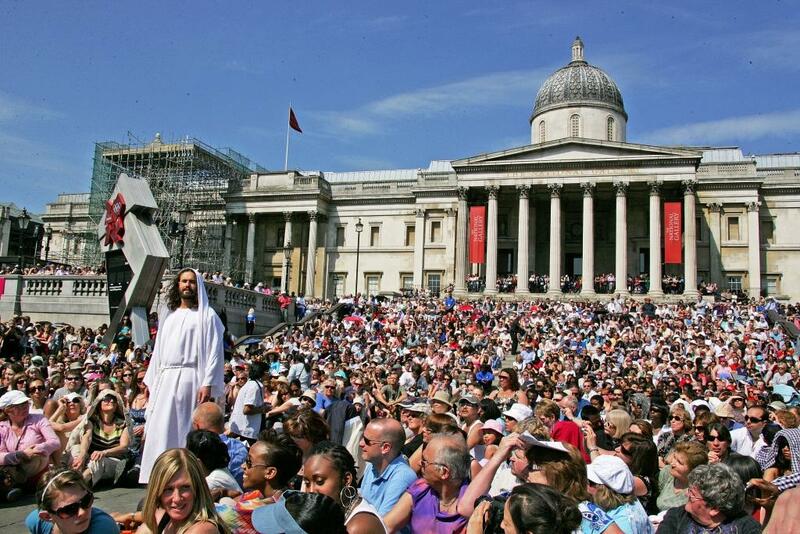 …then perhaps you could go to Trafalgar Square by midday for a couple of open performances which have our highest personal recommendation: The Passion of Jesus. We’ve booked for a third trip to ‘partake’ in this modern rendition of The Life of Christ, as well as an amazing Nativity, in open fields on the North Downs, south of Guildford. There, the actors mingle among the audience and it seems as though we travel back in time. It’s as though one’s there alongside Jesus and the disciples, watching and listening to all they say and do.